Freak Devil is a flying tourbillion, which replaces the usual oscillator of the other members of the family of the Freak. The cage has a “pointer” that indicates the seconds on a clear semi-circle, which rotates on itself in a minute, with the zero position indicator fixed on the axis of minutes. 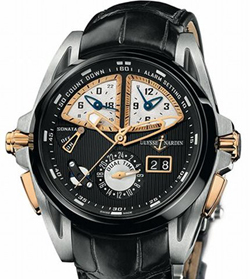 A perpetual calendar that combines amazing also the complication GMT. Its a very sophisticated watch: the movement and it stores all the actions that follow the simple setting of the date of the day, month, year, ordinary and leap, is able to instantly recalculate recalculate values also listed according to the momentary choice of another time zone.